I really wanted to come up with a more concise title, but as it stands, these three fiction picture books focus on the place of the library in African American history. Two of them were nominated for the Cybils Fiction Picture Book awards this year, and the first book won a Coretta Scott King Award in 2001. When this story takes place in Alabama in 1951, Louis isn't allowed to use the public library. When his father's own book collection runs thin, he turns to the small library at his church to find a book on President Lincoln. When he can't find the information he wants to know, he bravely steps into the public library to find the book he needs. 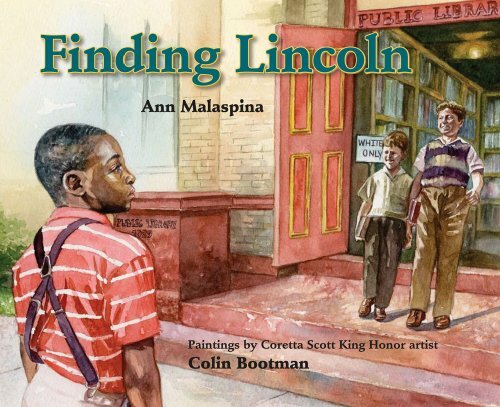 Some people are rude, but one librarian is helpful in getting Louis the book he wants which shows how Abraham Lincoln starting shaking things up even as a boy - just like Louis. The book contains additional information about segregation in libraries, plus a bit about Abraham Lincoln. The watercolor illustrations are lovely and capture the feelings and characters quite nicely. Ron loves books and is well-known at the Lake City Public Library for his frequent visits. He spends hours reading there, but this day is different. The nine year old boy is going to take on the system by demanding to be allowed to check out books. Knowing that the privilege is reserved for whites, he literally takes a stand to get his own library card. 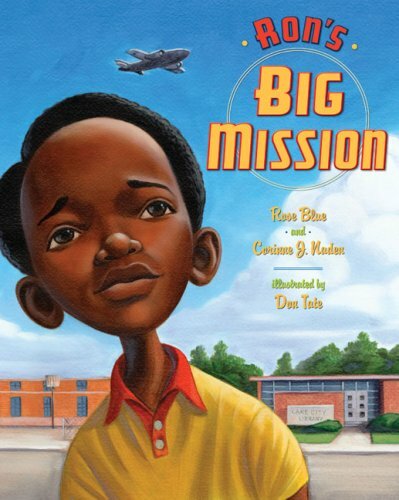 Based on a real incident in the life of Astronaut Ron McNair, the story gives a different feel to discrimination than most books on the subject, focusing on the institutional ruling than belief system. All of the individuals who encounter Ron - from the friendly elderly lady to the helpful librarian to the befuddled police - all want to help him, mostly by getting around the law. While it may not offer a more valid a perspective than other books that tackle discrimination, it puts the emphasis on an unfair law rather than racist people. The illustrations also lighten the tone, with the bright colors and expressive faces. A particularly good book for read-aloud in the classroom or library. Ask a simple question, get lots of fascinating answers. Last week, I talked about my home library and asked: "Do you organize your books? How so?" Between comments on the original post and on Facebook, I got over 200 responses. I thought you might enjoy reading a sample of them. There were lots of funny, creative and intriguing answers. The number one answer was: by physical attribute. Height, size, width and weight were all on the list. Also, whether the book was hardcover or a paperback. A surprising number of people said they sorted by color. See this picture for a beautiful example. "I live in an RV. The few precious books we keep are divided by owner (Mom/family) then fiction/non-fiction, then ordered by size (because space is at a premium)." "Hardcovers are shelved vertically and paperbacks end up stacked horizontally." "Height, so I can adjust the various shelves to the level of the books on them. (This drives people who organize by subject crazy by the way)." "As a grad student I had a special system. My personal library was broken down by subject, content similarity, book size, and color, since I knew exactly in my head which books I had and what each one looked like. I could find them much quicker that way." "I have photos of each of my bookcases, so that when I move, I can arrange the books exactly how I had them in the previous setting. I pack them according to bookcase too. Original arrangements are by topic, and size, mostly, often author, if several titles by same." "Arrange the children's books?? Try explaining that concept to my 4 year old." "I put them in a bookshelf. Then said child comes along and tears them all out. Then rinse and repeat." "I have 3 year old twins, I am happy if their books are back on their book shelf every night!" "My son's books always get scrambled through his room every time I try to organize them." "If I can keep the kids' books with the spines facing the right direction, we're doing well." "Are you kidding me? We have books everywhere. Just getting them on a shelf is an accomplishment. I take solace in the fact that the books are all over is because they love to read book, after book, after book." "My toddler is against organization." "Big books on the big shelf. Little books on the little shelf. Keep the books off the floor." "I have the board books down low, and a big shelf of readers. Then there is a giant pit full of oversized books I don't know what to do with. All the books in the kids' room are left to their own devices. It's all about serendipity up there." "On my adult shelves, by category, then author, then height, for visual appeal. On the kids shelves, there is a lot of traffic. So I just tidy and place by size so it looks neat." "I've got it 'easy' since my child is a toddler; all indestructible board books on one shelf, other books arranged by publisher/series on another shelf with a special spot for 'current reading' books. 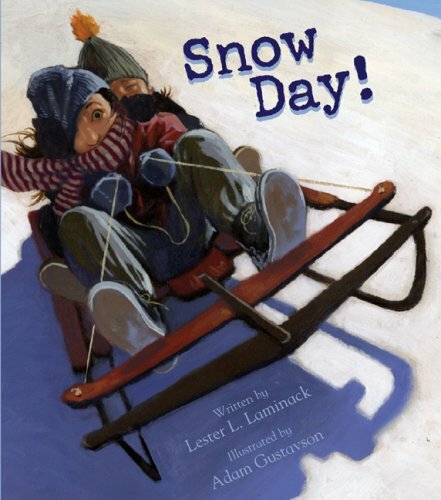 We're concentrating on winter/snow-related books this week." "As a child I wanted to be a librarian and taped little call letters to the fronts of all my books." "When my daughter was 8 she began organizing her book shelf by genre. I was in chidren's literature course while finishing up my English degree and she was fascinated by the work I had to do. So one day she decided to put all of her historical fiction, fantasy, biography, etc. in respective categories. I was impressed by how much she had learned." And I found that not everyone holds on to their books. "I try to give my books away. I only keep those I have an attachment to. I find it's better to share with the Veterans Admin., or library, or wherever so they are read again and again." "We recycle a lot of my son's books with their younger cousins. We lay out the books they've outgrown and invite cousins over to pick and choose what they like. The rest have gone to the friends of the library." "The most fun way to organize is to have the titles of the book all tell a story as you look the spines on the shelf. Sentences and poems are fun to make that way. I also like to put them in order by relation to one another." "I am a self-confessed bibliophile. I live with my books, constantly making stacks of the ones I'm reading at the moment and displaying them with other furniture about the room. At school, I've arranged low, long book shelves with one standing tall bookshelf for display of children's books with great, illustrated covers/sleeves and related artifacts that go with that theme. For example: Flotsam is on display with a collection of shells, clay sea creatures, etc." "I just want to know how she gets her kids to follow the system!" The truth is, I don't. I mentioned in my previous post that we had moved recently, but it was six months ago. My son had disorganized everything I had originally organized. Our books were everywhere, so last weekend, I made an attempt to put them back in some kind of order. We discovered lots of books this week because we were finally able to find them. And here are my favorite comments. I kept these until the end to give you a laugh. "By how short the errant chair leg is." "I organize them... mess them up a bit... then organize again." "The librarians do it for me. I store them in my library bag until they are all read, and then I drop them in the book return slot. Then I go look for more already-sorted books. It's like magic!" "Yep, right on the back of the toilet in order of which was most recently read!" Thanks to Lee Erickson for the beautiful pictures of his toddler granddaughter looking at books. See his whole post on the subject here (with more great pictures). Thanks to Alex Zealand for the picture of her five year old's bedroom and his book collection. At first glance, February isn't the most inspirational of months. The slog of winter feels, well, sloggy, and spring is still ages away. May we suggest a little writing prompt to help you and your kids through the doldrums? The Exquisite Prompt Writing Challenge from Reading Rockets and Adlit.org has just the right mix of ideas to get you going: Self-portraits, poetry, pourquoi tales, fabulous fables, and the 13th Labor of Hercules. This month, Shannon Hale (Princess Academy) and Calef Brown (Polkabats and Octopus Slacks) provide the inspiration and your kids do the rest. Any other creative ideas to break the February blahs? Or does anyone out there actually like February? I read that this winter is the only instance recorded that snow was on the ground in 49 of the 50 states at the same time. Hawaii was the holdout, even though they do get snow on their mountaintops sometimes. With the snowiest season I remember - and a record-breaking one in the Washington, DC area - it seems most appropriate to bring out the snow books. When a young boy wakes up to discover a world of white, he is in for a day of snowy fun. He finds animal tracks and tries to catch the rabbit who made them. He builds a snowman with his daddy, complete with hardhat and a wrench. And at the end of his adventure, goes inside for warmth and hugs. With bright, lively pictures and simple text, this is a book for the youngest readers. 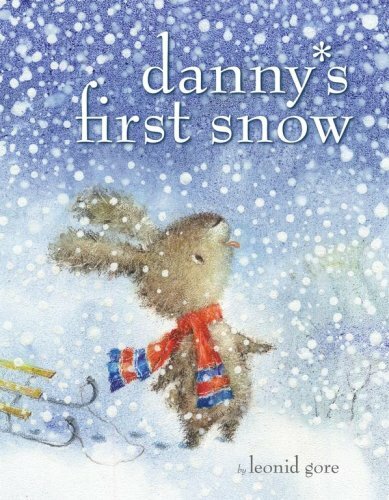 When a little rabbit goes out in his first snowfall, he sees friends in the piles of snow all around him. But they turn out to be trees and such buried in the snow. But it’s all good, because Mommy's waiting for him. The fuzzy art style makes it appear as if we’re viewing the illustrations through a sleet-encrusted window, which is nicer than it sounds. 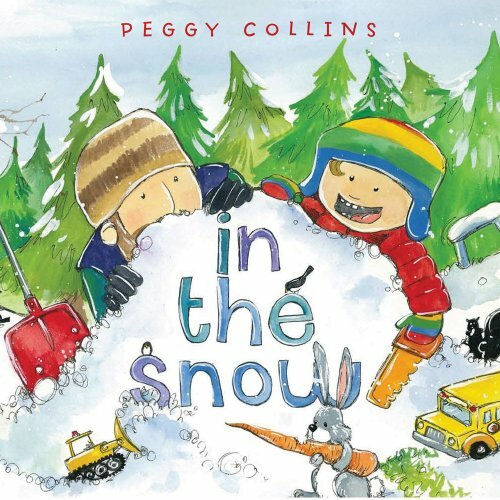 Gentle snowy-time book. I've already talked about the lovely Waiting for Winter and at MotherReader, I have a review of a very relevant book, The Terrible Storm. And I have so many others that I like for the winter months. What are your favorites? I spent a lot of time this weekend in the library, but I don't mean the public library where I work. I was organizing my home library. We've moved a couple of times, and every time the bookshelves get set up, I struggle with how to arrange the books. My children's book collection has grown quite large and by now encompasses at least 5 bookcases. This time when I shelved everything, I gave a great deal of thought to how my kids would use the library. On the bottom shelf I always put board books (which are impossible to keep in order, of course). When my older son was a baby, we kept his toys and board books on the bottom shelves, so that he could play with anything he yanked off. At the moment, most of the board books are in the baby's room which has a built in bookcase. The picture books went on the lower shelves to make it easier for my son to reach them. I also set up a stool near the bookcases, so he can reach the books up top. (The picture books go up to the fourth shelf on each bookcase because I have so many). My older son is starting to learn to read, so I pulled every early reader I had (2 shelves worth) and put them near the bottom also. That way, they're accessible any time he wants them. I couldn't leave it at that. I had lots more categories to organize! I made shelf space for compilations, Mother Goose, classics and poetry. I have a shelf for non-fiction, which I need to add to. Also, I always have a shelf for the Caldecott and Newbery winners (and I this year I'm going to add the honor books). Comic strip books, like the magical Calvin and Hobbes have just about taken over their own bookcase. I've given holiday books their own special section. That way I don't have to search through all the picture books every time a holiday comes up. Chapter books are on the top shelves, including long series and favorite authors. And of course, Harry Potter gets a shelf of his own. Also, whenever I organize, I always leave a box open for donations. It's okay (but hard) to give away books, but it's also a good idea to remove books that you don't like or bought on an impulse. That way you'll have more room for the rest. And yes, because I couldn't help it, I alphabetized the books by author. Only by letter though, so all the W books are on the same shelf. That makes it much easier to find multiple books by the same author author. Plus, when I'm looking for a book, it's much quicker to go to the right shelf instead of searching all the books. So here's a glimpse of a small part of my library. (Keep in mind that you're only seeing three bookcases). I actually have ten bookcases in use, most of which are filled with children's books. The shelves are not completely full, on purpose. That's for all the books we have yet to discover! But really, it doesn't matter how you organize it. The most important thing is that you have a designated space to put the books you read to your children and that they're able to access it on their own. Size doesn't matter. When I was growing up, my mom kept one small shelf of picture books in my brother's closet. I can't tell you how exciting it was every time I went to that shelf and picked out a book for us to read together. Do you organize your books? How so? 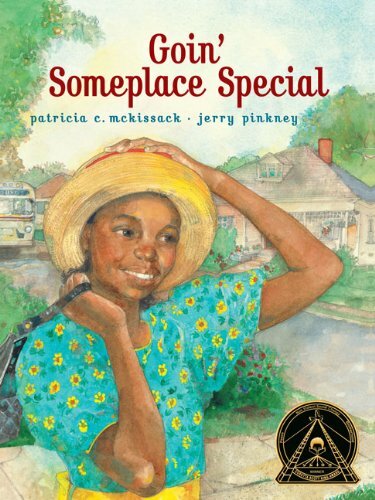 Do you have a special place set aside for children's books that your kids can access? Is it in their bedroom? The living room? Or someplace else. I'd love to see your children's bookshelves. Please e-mail me at booklights@pbs.org. If I get enough pictures, I'll showcase all of your bookshelves next week! Last month, my five-year-old daughter became fearful of going to sleep. There was no monster under her bed, in her closet or creeping down the hall. The monster she feared was in her head in the form of bad dreams. In my frantic search to ease her fears, I came across the most delightful book, Tell Me Something Happy Before I Go to Sleep, by Joyce Dunbar. Written over 10 years ago, it tells the story of a little rabbit named Willa who can't fall asleep because she fears bad dreams. She asks her big brother, Willoughby, to tell her something happy before she goes to sleep. He obliges. Willoughby gets Willa to see how the many simple things in her life bring her joy, such as wearing cozy pajamas, eating certain foods or looking at the night sky. Eventually, Willa falls asleep. This wonderful read-aloud is sweet and reassuring. I love how it addresses the power of positive thinking; a skill that will serve children well, even at night. Reading Tell Me Something Happy... with my daughter has become part of our nightly routine. Although she still frets about bad dreams, I now know how to help - I get her to tell me something happy before she goes to sleep. What books have helped to calm your child's nighttime fears? 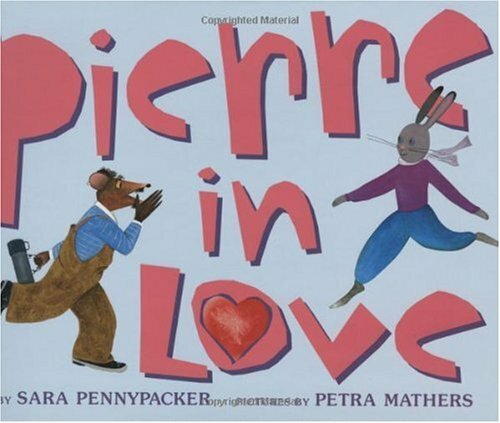 In the library, these are the days when we get frantic parents looking for a Valentine book to read at their child's school and finding that all the books are gone. 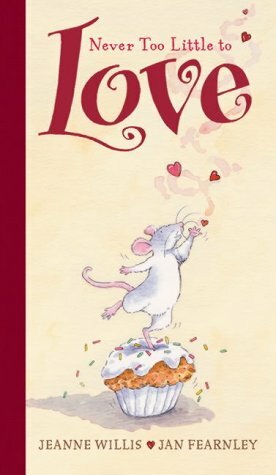 But here are some nice books about love that will nicely fill the gap. A mouse who wants to give a kiss to his friend, but she's way above him - literally. He stacks things precariously to get a little bit higher, but it's pretty clear that this homemade ladder is not going to hold. Fortunately the giraffe he loves bends down and offers a kiss. Simple and sweet, the book has sturdy pages for the littlest readers. 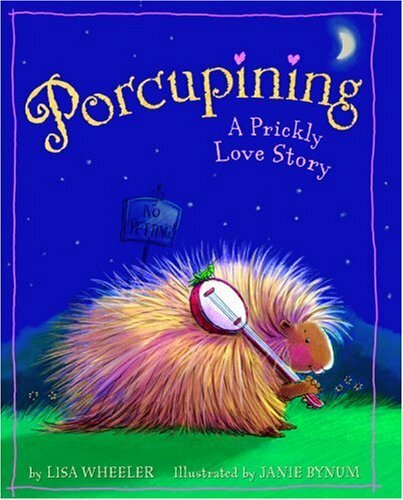 Alone and ignored in the petting zoo, the poor porcupine can’t find somebody to love. Oh but he tries, courting other animals with unintentionally insulting songs. Because no female, pigs included, want to be called "pink and fat." Just as he is about to give up hope, he meets a darling hedgehog. The cheery illustrations feature clever details, and the funny story will charm all audiences. When should you read Charlotte's Web to your children? It's a beautifully crafted book. The characters are vivid and easy for children to connect to. It's a wonderful combination of reality and fantasy. It does a "terrific" job of explaining friendship. It's a perfect chapter-a-night book, the chapters aren't too long and there are enough pictures to keep a child's interest. Also, a surprising number of the chapters end with a description of someone going to sleep, which makes it a great book to read at bedtime. But, but but... Charlotte dies at the end. There's no way to get around that fact or sugarcoat it. You can explain to your children that death is part of the natural cycle of things and that Charlotte's children live on. No matter what you say, though, I guarantee your kids will be sad at the end of the book. I know I am every time I read it. Many people read Charlotte's Web as a first read aloud. As a librarian, I frequently get asked what age the book is appropriate for. My answer is always that it depends on your child. Will they be able to handle it? I recently asked myself this same question when I was deciding whether I should read it to my son. Stuart Little and My Father's Dragon had both been big hits for him. Was he ready for Charlotte's Web? We talked about it for a while. He loved the cover and wanted to see more. I let him look through the book, taking in the pictures. I asked if he wanted to read the book, even if something very, very sad happens in it. He said yes... and we plunged ahead. It was a wonderful experience. He savored each chapter and always begged for another one when we were done reading. He adored the goose, goose, goose and the gander, gander, gander. He fell wholeheartedly in love with Wilbur. He was studying spiders in his science class and he soaked in all the facts about spiders presented in the book. Since he was on the cusp of learning to read, he was delighted to learn how to spell "pig" and "Charlotte" and then find those words throughout the book. Before we read the chapter, we talked about the fact that there was something really sad about Charlotte was coming up. I told him that she was going to die and asked him if he still wanted me to read it. He said yes, and he snuggled into my lap and I held him very tight while we read the paragraph above. And then we both cried and talked about it. But then we moved onto Chapter 22 where we met Charlotte's children... and there was hope in the story again. And we were both okay again. I asked him recently about the book (we read it a few months ago). He said it was one of his favorite books and he loved it. I'm planning to read it together again in a year or two. Jen mentioned that there is now an award in honor of E.B. White. Did you know that the Association of Booksellers for Children sponsors the E.B. White Read Aloud Awards each year? When did you read Charlotte's Web to your children? Would you do it again at that age level? Did you decide not to read the book to their kids? When did they read it to themselves? When did you read it to yourself? What was their reaction? What was yours? I'd love to hear about your experiences with this timeless classic.